The following example shows the typical findings of left ventricular involvement in Arrhythmogenic Cardiomyopathy (AC), also known as Arrhythmogenic Right Ventricular Dysplasia / Cardiomyopathy (ARVD/C). The case features a 18 year old boy who recurrently collapsed playing field hockey. He was admitted with palpitations. The ECG showed a sustained ventricular tachycardia with a left bundle branch block (LBBB) morphology and a superior axis. The ultrasound below shows our findings after cardioversion. 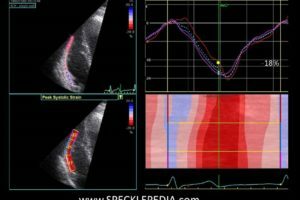 There is severe dilatation of the right ventricle with a clear reduction of systolic function. In the subtricuspid region, the RV is aneurysmatic. These findings are a major criterion for AC based on the 2010 diagnostic criteria. Based on these findings the diagnosis AC was met. Additionally, genetic testing revealed a pathogenic mutation in the PKP2 gene. The LV systolic function was preserved (LVEF of 55%). There were no clear regional wall motion abnormalities, although the posterolateral wall showed a patchy appearance on echo (see SAX view). 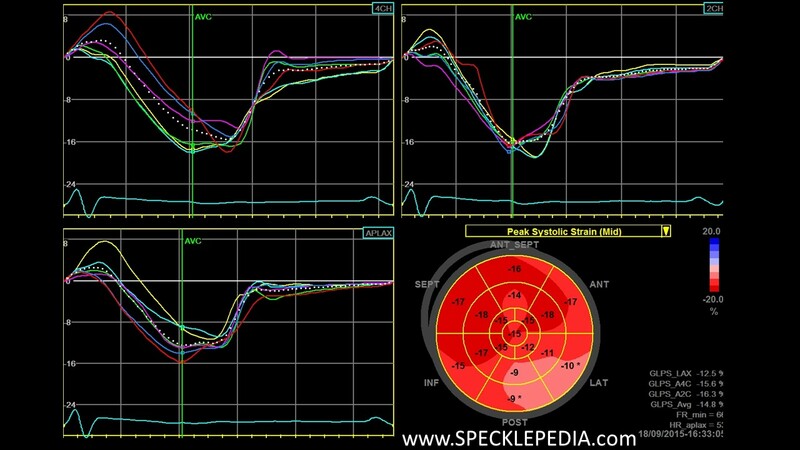 There is a reduction in peak systolic longitudinal strain in the posterolateral region. As seen in the post-systolic index bulls-eye map, these regions also exibit abnomal post-systolic shortening. This is a known predilection site for LV involvement in AC. Deformation graph of the 4-chamber view. 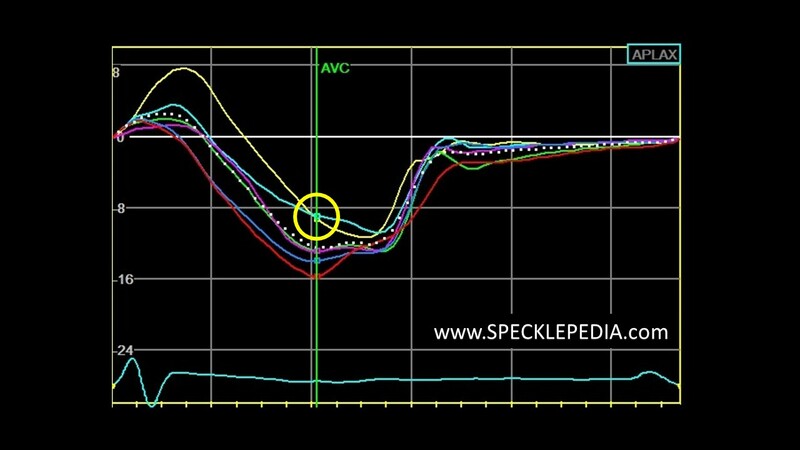 Note the reduced peak systolic values of the lateral wall segments of approximately minus 10% (yellow circle). These segments continue shortening after the aortic valve closure (post-systolic shortening), also a sign of abnormal function. 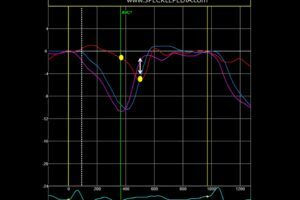 These findings are also seen the APLAX deformation analysis (yellow circle). 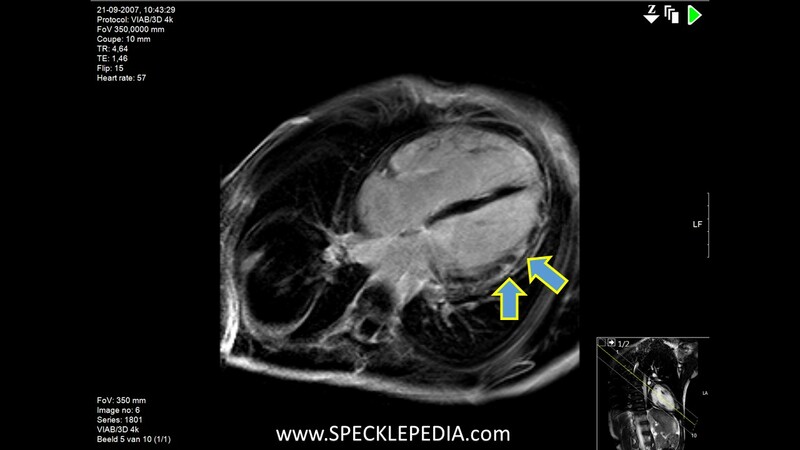 When encountering 5 adjacent segments (in different views) with abnormal deformation values and abnormal contraction properties, it is very likely that the LV myocardium is abnormal (in other words, false positive findings due to artefacts or inappropriate tracking are unlikely). 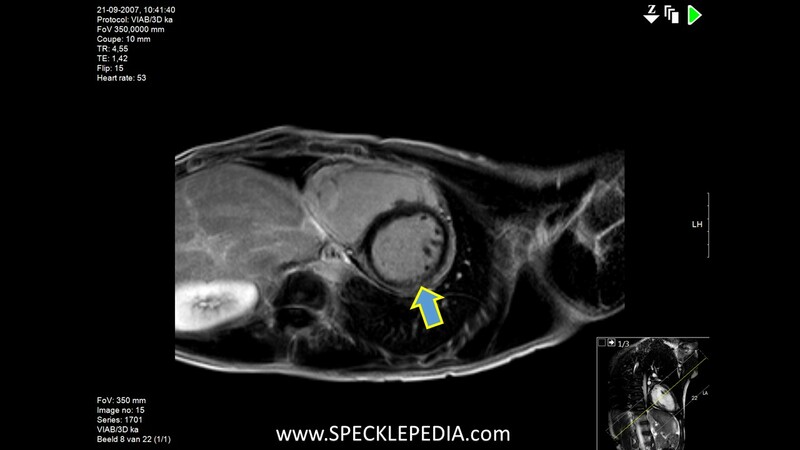 This was confirmed on MRI examination before an ICD was implanted. The delayed enhancement sequences revealed patchy fibrosis in the posterolateral regions located epicardial and midmyocardial.